It's horrifying that we are rapidly approaching the kind of culture that God ordered the Israelites to wipe out when he finally allowed them to enter the land he had promised them -- a culture of rampant immorality, idolatry and child sacrifice. For the longest time, the political left insisted that it was not pro-abortion but pro-choice, that it truly wanted to make abortion safe, legal and rare. I never could quite grasp why liberals would care about making it rare if they didn't consider the unborn to be human lives. But that is the position they firmly held -- obviously for political expediency. Their decision to cloak their true intentions in the euphemism of "choice" has always been a calculated strategy to sanitize their actual motives. If they were actually choice advocates, they would inform mothers contemplating abortions about all the risks of the procedure and advise them of alternatives, such as adoption. In practice, in many cases, we've seen just the opposite. If they are about choice and not abortion, why do they adamantly resist any proposed restrictions on abortion? Why do they celebrate their legislative expansion of the right to abortion, as New York Gov. Andrew Cuomo did in obscenely lighting One World Trade Center in ghoulish pink to commemorate his state's new law greenlighting abortion to the point of birth? Why do feminists proudly run around with T-shirts boasting of their abortions? Abortion can best be understood as a vital sacrament of their secular religion. Today, apparently feeling their oats because of President Trump's perceived unpopularity and the Democrats' strong showing in the midterm elections, they have started to be less circumspect about their true feelings and intentions. We've seen it with the Democrats' attempted removal of the words "so help you God" from the House Natural Resources Committee's oath, Sen. Kamala Harris' embracing of Rep. Alexandria Ocasio-Cortez's Green New Deal and Harris' endorsement of universal Medicare, until the public blowback forced her to retreat. And we've seen it with these new state laws further liberalizing abortion. We've also seen it in the evolution of the left's arguments on abortion. Liberals used to consider the unborn baby, at least prior to the point of viability, an unviable tissue mass -- a clump of cells -- and thus there was no moral question involved in the mother's exterminating it through an abortion procedure. But in recent years, some of the more brazen pro-abortionists have admitted that the unborn are human lives yet have maintained mothers' right to kill them anyway. No more apologies, just more fist shaking and rebellion. 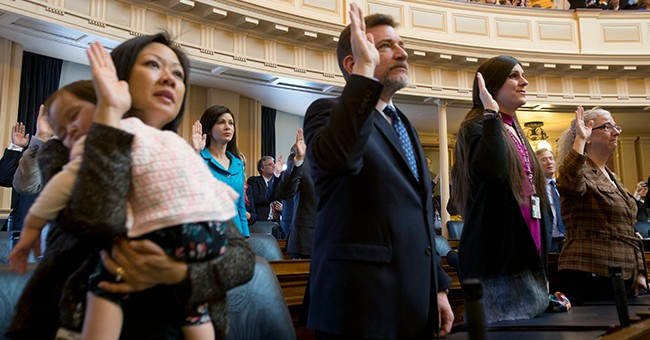 In some ways, Virginia's proposed legislation is worse than New York's. Virginia state Rep. Kathy Tran's proposed bill would permit an abortion even when a mother is in labor. When asked whether the mother could abort her child when it is obvious she is about to give birth (when dilating), she admitted, "My bill would allow that, yes." Virginia Gov. Ralph Northam's comments were even more abhorrent, confessing that the law would permit a baby's murder after it's born. How hardhearted must this pediatric neurosurgeon be to endorse legislation permitting infanticide? People with just a speck of moral fiber might have difficulty wrapping their minds around this. With these state abortion laws, we're not talking about someone committing a heinous act and then begging a court for leniency; we're witnessing a deliberative body making a conscious, premeditated decision to legalize murder. The radical abortionists who now hold sway in the Democratic Party are either paranoid about "toxic males" taking away women's freedom or part of a death cult -- because they refuse to cede even an inch of ground on abortion. From a biblical perspective, this seems nothing short of demonic. Pro-abortionists shrewdly couch their advocacy in the benign language of preserving mothers' health. No one would dispute that the state has a strong interest in protecting a mother's life and health, but "a mother's health" doesn't necessarily mean what they want you to think it means. It has become a catchall to permit abortions that have little to do with mothers' actual health. If leftists are that concerned with mothers' health, why do they dismiss any research that shows that abortive mothers frequently experience physical, emotional and psychological damage from abortion? Why do they insist that late-term abortions are about health when medical experts such as Dr. Omar L. Hamada say "there's absolutely no reason to kill a baby before delivery in the third trimester"? Why does the New York law permit non-physicians to perform the procedure? The leftists' newfound smugness could well backfire. Their main appeal, especially to young voters, is their claimed monopoly on morality and compassion. They paint themselves as moral exemplars and conservatives as uncaring bigots. Their callousness could wake up younger generations, which they've spent decades indoctrinating, to their moral contradictions. It may take younger people longer to realize that the left's promise of socialism is an insidious lie -- that everywhere and every time it has been tried, it has impoverished and enslaved people. But I doubt they'll have as much difficulty immediately grasping the left's depravity in outright advocating the murder of innocent infants while moralizing to us about universal health care, income inequality and separating mothers from their children at the border.